Fernandez & Wells at Somerset House is one of those cafes that just works perfectly. It’s the marriage of a spectacular setting and incredible food and every time I go it brings a smile to my face. It this case, obviously, the magnificent Somerset House has a lot to do with the experience. It truly is one of the finest of London buildings. Home to the wonderful (and often overlooked) Courtauld Institute, a spectacular open air cinema in the summer, a beautiful ice rink in the winter, numerous temporary exhibitions and events, the Rizzoli bookshop, bars, restaurants and a terrace overlooking the Thames(!) – but whenever I am there I seem to gravitate to the East Wing for Fernandez & Wells. Great coffee, sandwiches, soup, the ubiquitous jamon, cheese, chorizo, wine and cakes. I could easily spend a lot of time and a lot of money here (it isn’t cheap! ), but despite the obviously stylish interior and setting this is basically simple food. Very good, well-sourced food (like the succulent, plump anchovies I devoured) but still quite basic really. There isn’t any real fancy cooking going on – it’s the freshly-made food and drink that makes this an exceptional cafe/bar. Specially commissioned artworks by David Tremlett grab the attention but try and grab a seat by the windows and look out on the near perfect setting. 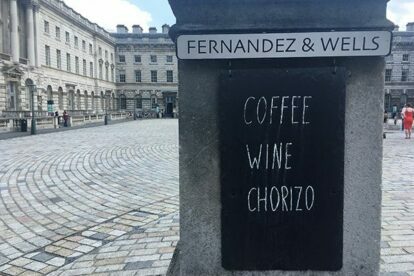 Somerset House was always one of London’s cultural highlights before F&W moved in, but now, thanks to Fernandez & Wells, it is just a little bit better.